Things were going well in the art world of Gerald Geerlings in the late 1920’s and early 1930’s. After serving in the US Army during World War I, he had graduated from the University of Pennsylvania School of Architecture but decided that he would like to follow his love of creating art. Despite the coming of the Great Crash in 1929 and the onset of the Great Depression of the early 1930’s, his etchings were selling well and he was making a decent living from his art. 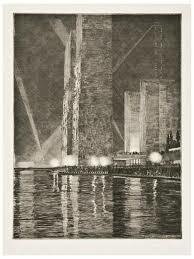 His “Electrical Building at Night” (1933) etching won the competition for the best etching of the Century of Progress Chicago World’s Fair. 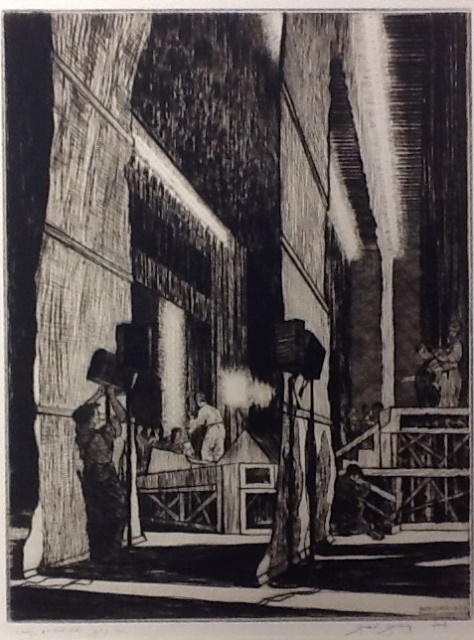 He received a $500 prize and the etching was also chosen as the 1933 Presentation Print for the Chicago Society of Etchers. This income and the sale of other etchings made a good living for Geerlings. In fact, it was enough for him to spend 6 months a year in London to work on his art. Flash forward just a couple of years and the market for etchings had dwindled to next to nothing. 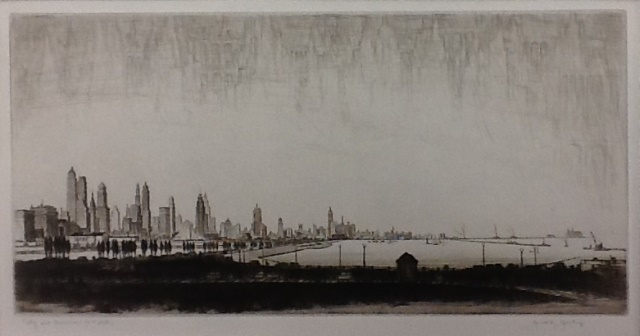 Like many etchers of his era, Geerlings was represented by Kennedy and Company of New York. In a later interview he recalled how from time to time he would stop in at the Kennedy Gallery and found the “absolute stillness unnerving” and would ask if there was “any justification for new plates.” By this time his income from prints had become “almost negligible.” He resorted to illustrating architectural articles to support his trips to London to focus on his etching. By the late 30’s Geerlings had totally abandoned his print making and made his living as an architect, illustrator and author. Then along came World War II. He enlisted in the US Army Air Corps and played a key role in improving the accuracy of Allied bombing of Germany. Before the War, he frequently flew on commercial airlines and enjoyed drawing his views from the air. Using his artistic skills and this experience, he drew maps of targets for the bomber pilots to follow. His efforts were so successful that he was honored with the Legion of Merit. He continued to do work for the Strategic Air Command until 1952. Geerlings continued his combination of writing, illustrating and architecture until the 1970’s. Although the sales of works on paper grew substantially during the 50’s, 60’s and early 70’s, it was centered on non-representational, colorful “modern” work and not on the type of art Geerlings enjoyed. He stayed on the “sidelines” of the creative art world. Geerlings second career in creating art took off in the 1970’s and 1980’s. 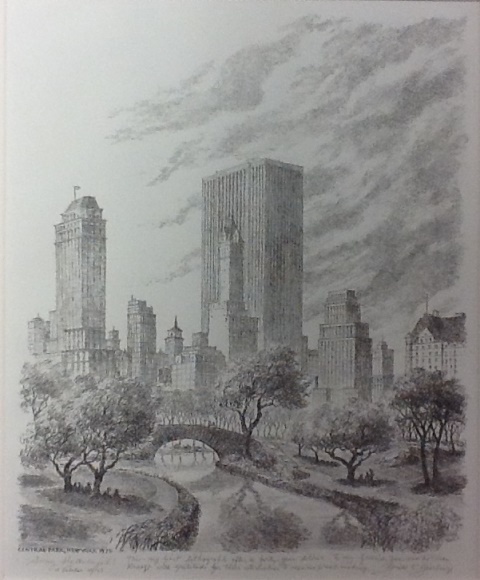 He created many lithographs of New York and Paris. He was also commissioned to do sketches of Paris and produced over 150 pen and ink drawings of the city. Gerald K. Geerlings died in Connecticut in 1998 at the age of 101.